Discipleship: The Alternative to Self-Serving Pride. My daughter is 3-years old and it is a joy to watch her grow up. Lately I have noticed how insistant she is on letting others know what is hers. She will tell you that our dog is only her dog or that the TV is only hers. I know at this age it is innocent selfishness. However, my wife and I will spend the next twenty or so years trying to teach her to not be selfish and instead become a servant (with many sucesses and failures I am sure). The irony is that my wife and I are still learning how to be servants rather than self-serving people. And then there are scome Christians who just seem to be very complacent with their selfish motivations. 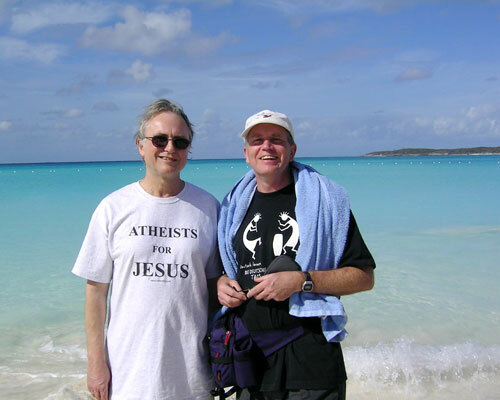 If Richard Dawkins, a professed atheist, can dawn an “Atheist for Jesus” t-shirt because he believes Jesus’ approach to living (self-sacrificial service) is right, why do so many Christians struggle with this? Do we understand? We think God is really interested in our arguments that iron out the most minute details of doctrine regarding Christian worship and the church. Is God really that interested in such arguments? Hmmn… Thursday evening before the Passover where Jesus knows he will be arrested, tried, falsely convicted, and crucified to death before being raised in glory and what lesson did he take the time to teach his disciples but the alternative way of life — becoming a self-sacrificial servant. Now that is a lesson I struggle to understand, let along do. May we help each other get on board with what is of most importance and help each other to become disciples, self-sacrificial servants just as Jesus. One one hand an atheist agreeing that Jesus taught us a great example is a great victory for the Bible’s authenticity and accuracy. If he can accept part of the Biblical record then the rest should be acceptable as just as accurate and faithfully transmitted over time. On the other hand it misses some of the harder teachings like: Jesus is the son of God, he was a sacrifice for our sins etc. But its a start. Kudos to Dawkins for wearing anything at all that says “Jesus” on it. Yes, agreeing that the morality and ethics of Jesus is a great thing but it is a far cry from confessing him as Lord and Savior. Good thoughts, brother. It is sobering to think that Dawkins is carrying the missional mantle. Do you suppose he’s up to something? In one sense, the pic of Dawkins serves as a great illustration (as I have used it). On the other hand, it seems very fashionably suave to drap Jesus on you back…just like the WWJD braclets. I can wear something sporting “Jesus” in on fashion or the other and it never be anything but a facade. There was a time when I had several WWJD braclets thinking that would mark me as a disciple of Jesus. Then I went to Brazil and visited with an elderly woman paralzed who cleanliness fell short of my standard. I found myself struggling to show her any proper human dignity for fear that she was dirty. Then I watched another Christian woman embrace her with a big hug and whisper that God loves her. I was convicted. I learned that day how to show love to the least of these. I also learned that braclets and t-shirts do not mark me as a disciple of Jesus. It is only love that can do that. The funny thing is, not too many verses after the foot washing scence does Jesus tell his disciples that love is what will mark them as his (Jn 13.34-35). I am still learning how to love as Jesus commanded.